We’d love your help. Let us know what’s wrong with this preview of Cactus Soup by Eric A. Kimmel. A version of “Stone Soup” set during the Mexican Revolution a hundred years ago. To ask other readers questions about Cactus Soup, please sign up. This seemed so familiar as I read along. When other reviewers mentioned "Stone Soup," the story came back to me. This version is also enjoyable. The tale holds messages about sharing and togetherness. Kimmel, Eric A. (2004). Cactus Soup. P. Huling. New York: Marshall Cavendish. Hungry soldiers ride into the town of San Miguel to eat and rest but the townspeople hide their food and pretend to be very poor. The captain asks for a cactus thorn and he begins to make cactus soup. The townspeople are tricked into adding salt, pepper, vegetables, and meats into the soup and soon enough the town of San Miguel is transformed into a lively fiesta Kimmel, Eric A. (2004). Cactus Soup. P. Huling. New York: Marshall Cavendish. Hungry soldiers ride into the town of San Miguel to eat and rest but the townspeople hide their food and pretend to be very poor. The captain asks for a cactus thorn and he begins to make cactus soup. The townspeople are tricked into adding salt, pepper, vegetables, and meats into the soup and soon enough the town of San Miguel is transformed into a lively fiesta. The colorful, detailed southwestern style illustrations do a nice job of representing the time period and avoiding cultural stereotypes. 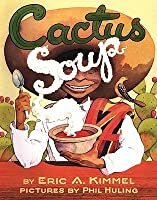 Cactus Soup is an interesting retell of Stone Soup. This version of the story takes place in San Miguel during the Mexican Revolution with a group of cunning soldiers riding into a stingy town. The cunning soldiers trick the townspeople into participating in a potluck style making of cactus soup. This book teaches the morality of helping one another and shows Mexican culture throughout. 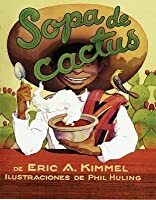 This book could be used to introduce the topic of the Mexican Revolution and to teach about Mexican cult Cactus Soup is an interesting retell of Stone Soup. This version of the story takes place in San Miguel during the Mexican Revolution with a group of cunning soldiers riding into a stingy town. The cunning soldiers trick the townspeople into participating in a potluck style making of cactus soup. This book teaches the morality of helping one another and shows Mexican culture throughout. This book could be used to introduce the topic of the Mexican Revolution and to teach about Mexican culture. Students could also discuss the importance of helping one another in times of need. Students could participate by making their own stone soup by finding materials around the classroom. Spanish words could also be talked about among students and context clues could be used to find the meanings of the words. This story is based on the classic tale, Stone Soup, but is set in Mexico in the early twentieth century. I thought it was a wonderful version of the story and I liked the author's note at the end of the book, explaining his inspiration for the story. The liberal use of spanish words sprinkled throughout the tale in italics works really well. The narrative is entertaining and we liked the colorful, almost exaggerated illustrations. We really enjoyed reading this book together. Summary: This version of Stone Soup is set during the revolution in Mexico. A group of hungry soldiers run into this town and ask for food. The towns people slowly give them more and more food as they become intrigued by the idea of cactus soup. Evaluation: This book does a great job in including the definitions of the words the students may not know and information about the revolution in Mexico. Though it is a good interpretation of Stone Soup, it does not embody the Mexican Culture well due t Summary: This version of Stone Soup is set during the revolution in Mexico. A group of hungry soldiers run into this town and ask for food. The towns people slowly give them more and more food as they become intrigued by the idea of cactus soup. Evaluation: This book does a great job in including the definitions of the words the students may not know and information about the revolution in Mexico. Though it is a good interpretation of Stone Soup, it does not embody the Mexican Culture well due to the overabundance of stereotypes. Teaching Idea: I would use this book in a read aloud along with stone soup to open up the topic of comparing and contrasting texts. After, the students would create a Venn Diagram to compare and contrast the two stories. For students who are at a higher level, I would include another version of the same story. I first discovered Eric Kimmel when I read his novel-length Russian Folktale, “I Know Not What, I know Not Where”, and have enjoyed several of his other books including “Herschel and the Hanukkah Goblins”. 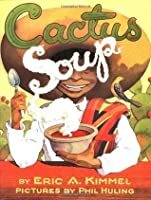 “Cactus Soup” is a re-imagined version of the classic “Stone Soup” but set around the Mexican Revolution. There is a small glossary of Spanish words that are used in the story and some historical background about the Mexican Revolution. The illustrations are unusual and go well with the story. Does the captain find a way to feed himself and his soldiers? I'm not sure of whither I thought this was a great book or not for this age level as they may decide to try to be as clever as this captain was of deceiving a small town's mayor as he did? Quite brilliantly illustrated picture book so I will rate it as a five star ebook. Would also like to recommend this for those ages 6-8 and or may be in grades 1-3. I received this for free using KU, in return, here is my honest review. Super work Eri Does the captain find a way to feed himself and his soldiers? I have heard of the tale of stone soup before but I enjoyed this new spin on it. I think it is neat that it has Hispanic context to it which is great for diversity of books in a classroom. This books also has the underlying theme of community and how when people work together they can accomplish much more then alone which is always great to bring into the classroom setting. I would definitely add this to my future classroom library. When soldiers come into the town of San Miguel, the mayor advises everyone to hide their food and to go around looking hungry. The mayor was scared that the soldiers would eat all of their food, but instead the soldiers offered to make Cactus soup for everyone. Eventually the soldiers ask for more things to put in the soup, like carrots and peppers and the town manages to give it to them. The soldiers create a huge feast for everyone in the town. Beautiful illustrations! I randomly grabbed this at the library and my 4 almost 5 year old LOVES it! We own the Asian version ‘Stone Soup’ and she didn’t much care for it. After reading it the first time she asked me to reread it immediately and after we finished she wanted it a third time. I enjoyed the story but was very surprised at how much she enjoyed it. Read it to my boys at night, they enjoyed it as did I :) will read it again and again. I liked this variation on Stone Soup. We are studying the Mexican Revolution right now, so it was great to read with my kindergartner. My 6 year old thought it was really funny. He wanted to know when we could read it again. Loved it. Cactus Soup was interesting and entertaining. It provided insight into the cultures of the town San Miguel. It was also informative and had a theme that readers could learn from the story. Spanish language was also incorporated into the story and character's dialogue. Cactus Soup is a a Mexican twist on an old tale known by many as Stone Soup. As the story begins, a troop of soldiers come riding toward the town of San Miguel. But the people of town weren't at all happy to learn of their arrival. They then plot to hide their food and tell the soldiers they've nothing to give them in hopes that this would encourage the soldiers not to stay. It's quite interesting to learn how and where all the food is hidden out of sight from the strangers. And to take things e Cactus Soup is a a Mexican twist on an old tale known by many as Stone Soup. As the story begins, a troop of soldiers come riding toward the town of San Miguel. But the people of town weren't at all happy to learn of their arrival. They then plot to hide their food and tell the soldiers they've nothing to give them in hopes that this would encourage the soldiers not to stay. It's quite interesting to learn how and where all the food is hidden out of sight from the strangers. And to take things even further, the townspeople tore & ripped their clothes as well as smeared mud all over their faces to appear like poor hungry people. Ah, but the Capitán in this story is not at all tricked! He then asks for a cactus thorn to make cactus soup. The townspeople are a bit more than willing to add to the soup by the charm of the stranger. Things gathered from those hiding places included chiles, salt, onions, garlic, beans, carrots, tomatoes, & stewing hens. His wit and the curiousness of the townspeople resulted in a fiesta that was enjoyed by everyone. Oh yes, more than just the Cactus Soup was enjoyed by everyone but tamales, sweet potatoes, and roasting pigs as well! My children age 2 1/2 and 5 years old have heard other renditions of this story but equally loved this one too. I really loved the Mexican version because it's given me an opportunity to teach my children about other cultures. My daughter was quite curious about the attire as well as the food that was included into the cactus soup. The watercolored and ink illustrations fit the story perfectly and capture the time and the place in Mexico during the Mexican Revolution quite well. Though not mentioned in the story, readers can learn a little bit of history in the Author's note in the back of the book. There's also a glossary that explains all of the Spanish words used but there's not a pronunciation guide which would have been helpful. There's obviously a strong message behind this story. The message basically teaches not to be greedy with what you have and obviously the outcome of giving resulted in a feast enjoyed by all. I'm sure the townspeople felt pretty silly hiding all their food and going to the extremes of ripping their own clothes and smearing mud upon their faces shortly thereafter. 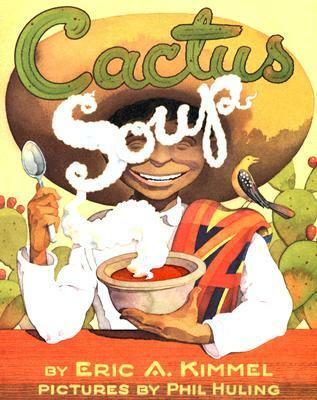 Cactus Soup is a retold version of the classic tale, Stone Soup. This folklore is appropriate and engaging for students in Kindergarten-third grade. Although most third graders would be able to read this book independently, the underlying themes would create rich discussion with students in this age group. Also, having read Stone Soup many times as a child and to my students over the years, it was easy for me to connect to this story. In order to help my students identify the main idea and m Cactus Soup is a retold version of the classic tale, Stone Soup. This folklore is appropriate and engaging for students in Kindergarten-third grade. Although most third graders would be able to read this book independently, the underlying themes would create rich discussion with students in this age group. Also, having read Stone Soup many times as a child and to my students over the years, it was easy for me to connect to this story. In order to help my students identify the main idea and moral in Cactus Soup, I plan to have them listen to both versions of this tale. After, we will discuss similarities and differences between the literary elements in each text. For teachers that do not have a personal copy of this book, there is a read aloud version available online, https://vimeo.com/20863155, where students can listen to the author, Eric Kimmel tell this story. I like this book because it brings the old stone soup story to another dimension, that is, relating it to the Southwest culture of Mexicans and Mexican-Americans. It takes place in Mexico in San Miguel during the Mexican revolution so it is more directly related to Mexican nationals or aficionados of Pancho Villa. I am Mexican-American so I can relate more easily to the food than anything else. For example, I can relate to the use of chiles and camotes which are sweet potatoes in the story. The book also has a clever plot that stimulates children to think critically. The soldiers outsmart the villagers and as a result the villagers become more "generous." Generosity pays off heartily for all in the end. Overall, the book is very witty, smart and cute with amusing colored illustrations in bright oranges, greens and yellows which are the colors of the desert Southwest. The only thing I don't understand is wouldn't some poor, unfortunate person choke on the one cactus needle in the soup? They are sharp. (I sure hope not). Even so,I do strongly recommend this fun and functional story wholeheartedly. Cactus Soup is an oustanding childrens book. When I first read the book, I could picture the story in my head. The story is suposed to take place during the times of Pancho Villa and Emiliano Zapata, as the people of Mexico tried to take back control from the wealthy. Cactus Soup is a perfect example of the struggles during those times. The story is about a pueblo and the coming of soilders into the pueblo. In the past, when soilders come into the pueblo,they would take everything, and seem to l Cactus Soup is an oustanding childrens book. When I first read the book, I could picture the story in my head. The story is suposed to take place during the times of Pancho Villa and Emiliano Zapata, as the people of Mexico tried to take back control from the wealthy. Cactus Soup is a perfect example of the struggles during those times. I love the story of Stone Soup, and this was a fun re-telling of it! I greatly enjoyed the Spanish flair added to this version. Instead of using a stone to make soup, a cactus needle is used instead. Instead of a beggar, soldiers from the Mexican Revolution are used, and instead of an old woman, a whole town is fooled. It's also a great way to learn a few Spanish words! I especially enjoyed the p I love the story of Stone Soup, and this was a fun re-telling of it! I greatly enjoyed the Spanish flair added to this version. Instead of using a stone to make soup, a cactus needle is used instead. Instead of a beggar, soldiers from the Mexican Revolution are used, and instead of an old woman, a whole town is fooled. It's also a great way to learn a few Spanish words! I especially enjoyed the pictures in this version. They're unique and whimsical and fit perfectly with the story. I'm excited now about reading some of Kimmel's other re-tellings! If you enjoyed Stone Soup, definitely give this version a try! Here is another book that involves some trickery, the towns people think that they can hide all their food and not share any with the soldiers. So when the soldiers show up in town the people act poor like there is nothing for the soldiers to get there. The only problem was the captain was a little smarter then the town people. He says hey we can make food for everyone, all we need is a cactus needle, and some water to make cactus soup. Pretty soon the town people add a few little things that th Here is another book that involves some trickery, the towns people think that they can hide all their food and not share any with the soldiers. So when the soldiers show up in town the people act poor like there is nothing for the soldiers to get there. The only problem was the captain was a little smarter then the town people. He says hey we can make food for everyone, all we need is a cactus needle, and some water to make cactus soup. Pretty soon the town people add a few little things that the captain wishes they had, and before long they are bring things out like chicken and tortillas. The captain was successful in coning the town people out of their food without them even knowing. 1. Have the kids be a different ingredient, and then come together in a circle to make the soup. Annotation: A group of soldiers in Mexico come to a town for food and a place to rest, but none of the townspeople have any food. Using a cactus needle and their wit, the soldiers manage to have a feast. Writing – Students could imagine that they are one of the townspeople writing a letter to a friend about the soldiers’ visit to the town. Consider some of these questions when writing: How would you (the townsperson) describe the soldiers? The soup? The fiesta? Science – Bring several kinds of cacti to the classroom for children to observe their slow growth. Monitor the amount of water given, measure growth in height, etc. Do some of the cacti bloom? What purpose do the thorns have? This book is a fun and colorful twist on the story of stone soup. It takes place during the Mexican Revolution and tells the story of sneaky soldiers who trick a town into putting all their hidden food into soup for the soldiers. The story is sure to have children giggling. The illustrations in this book depict traditional dress during the Mexican revolution, and I like to look at pictures from the Mexican revolution with my students before reading this book. Additionally, we contrast the illust This book is a fun and colorful twist on the story of stone soup. It takes place during the Mexican Revolution and tells the story of sneaky soldiers who trick a town into putting all their hidden food into soup for the soldiers. The story is sure to have children giggling. The illustrations in this book depict traditional dress during the Mexican revolution, and I like to look at pictures from the Mexican revolution with my students before reading this book. Additionally, we contrast the illustrations with pictures of people and places in Mexico today. Unfortunately, the story itself does little aside from the setting to address Mexican culture. Still, with some added context, students will take away a good moral, creative solutions to a problem, some Mexican history, and a fun time. Eric worked as an elementary school teache Eric A. Kimmel was born in Brooklyn, NY in 1946. He attended PS 193, Andries Hudde Junior High School, and Midwood High School. Brooklyn College was across the street from his high school, so he didn’t want to go there. He headed west, to Easton, Pennsylvania where he graduated from Lafayette College in 1967 with a bachelor’s degree in English literature.